High-rise housing blocks are all too often concrete monstrosities, the kind of places that don't exactly scream Home Sweet Home. 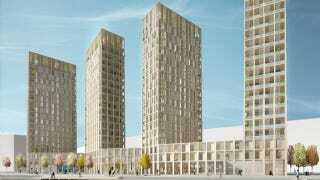 In an effort to make them just a little more welcoming, Swedish architects are proposing an all-wood construction. Building skyscrapers out of wood isn't a totally novel or ridiculous idea. You have to understand that architects aren't just proposing to stick up a couple of really long 2x4s and call it a day. Prefabricated, cross-laminated wooden beams are surprisingly strong, and better than steel in a fire. Plus, from an economic perspective, an all-timber construction gives work to rural farmers, and it's even environmentally friendly. But practicality aside, the design from Tham & Videgård Arkitekter just looks much better than any other high-rise I've seen. The open design is far less imposing than any 20-story building made from concrete; it's somewhere I would actually want to live.